The Medieval times were an extremely violent era in history and all men were expected to have the skills and weapons to defend or attack enemies. The Medieval Quarterstaff was a cheap weapon to produce being made of ash, oak or hawthorn. It is therefore most commonly associated with the lower classes, although nobles and knights also practised with such weapons increasing their weapons skills, strength, speed and agility. This weapon was lethal and highly effective even against cutting weapons such as swords and daggers. 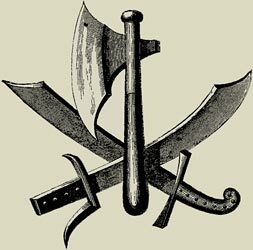 Quarterstaffs offered the advantage of being extremely versatile. Blows from quarterstaffs could be alternated from striking, jabbing and bludgeoning to thrusting like a spear. The style of attack could therefore change extremely quickly making it difficult for the enemy to respond quickly. The weapon also had the advantage of its long length. The Medieval Life and Times website provides interesting facts, history and information about the weapons, armor and battles in Medieval history, including the Quarterstaff, which scatter the history books. The Medieval Times Sitemap provides full details of all of the information and facts about the fascinating subject of the lives of the soldiers and knights who lived during the historical period of the Middle Ages. The content of this article on Quarterstaff provides free educational details, facts and information for reference and research for schools, colleges and homework for history courses and history coursework.